Armed forces march on their stomachs. Logistics is an important consideration but not something we could call a weapon. Field engineering, or 'digging' (alien to most modern reenactors), is essential for warfare too and impossible without a spade (and pick and crowbar and barrow/bucket) . In extremis one could possibly smack an opponent with a spade? Viking Period spades are carved from planks of tough wood such as beech or oak. They often have a single 'step' on one side and can be fitted with a metal cutting edge. The handle is straight and may have a cross-piece or looped handle. Shovels are lighter, with a broader blade and with no metal fitting on the cutting edge. Traditional spades from Hungary. Very similar to Viking Age finds. Using the Irish 'loy' - a descendant of iron-age iron-shod spades. 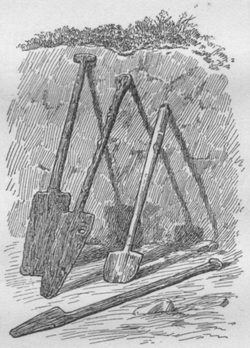 Spades found in Jelling mound. Click for large image. 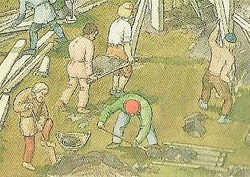 The mound at Jelling revealed several spades and shovels. Pointed spades may be good for breaking earth and moving stones, like the Irish 'loy'. 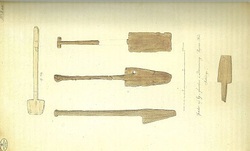 Flat-bladed shovels are better to move loosened earth .These are made of oak and beech. Scale on picture is in inches. Earth was moved on litters or maybe waggons. Wicker baskets could also be used. An interesting question is WHO did the work ? Slaves ? Locals ? Raiders ? Repton, base of the Great Heathen Army in 873AD. A fortified monastery. An invader is isolated in the country he enters. 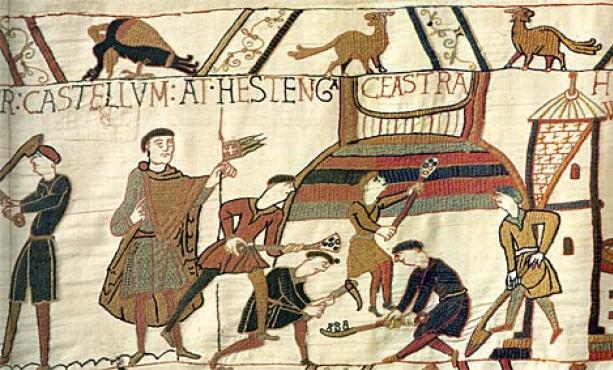 Viking forces could take advantage of the poor communications of the time to arrive unannounced in their ships and keep one step ahead of the defending forces by moving-on by ship or horse. Once the defenders were reacting , then the invaders were also vulnerable to being taken by surprise. The solution is to establish a base for operations which is secure. This then forms a refuge for retreat and a place of safety for valuables , wounded and sick, and slaves or families. The Viking forces time and again hold out against attempts to counter-attack them because they have such a base. The base-camp could be a pre-existing set of buildings such as a monastery or palace. These could be easily modified to form a fort. If nothing suitable was available then an earthwork could be raised in a half-ring against a river. The raiding forces ships would then be secure while they could be sailed out when desired. William's castle under construction at Hastings. In principle vikings could do the same.